Last year we saw various cars made by the countries of the Axis Powers living and dying in Poland. 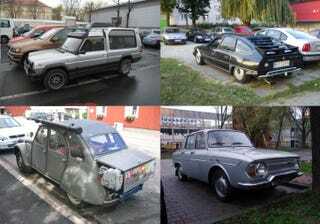 There West German cars, East German Cars, Japanese cars, and Italian cars. Last month we moved onto Allied Powers cars, starting off with the final entry into the conflict, 'Murican Cars. Today we will look at the oldtimer French cars that are living in various states of usefulness in modern day Poland. All pictures are courtesy of the best Polish automotive website ever, Zlomnik.pl, and all its readers who send in all these pictures from all over the country. Grab some coffee and a croissant, check out the awesome and awful cars, then light up a non-filtered cigarette like the French whore that you are!